Let me start by telling you that it is sooo darn chilly here in NJ! We pulled out a second blanket last night and I slept in long sleeves! Not even 3 days ago it was near 80 degrees! Which was awful and I have no desire to return to that. I'm a fan of chilly weather but man, it came outta nowhere. We coped by brewing cup after cup of tea and pulled out the sweaters...Jimmy Carter would be proud of us for not turning the heat on. We also kept warm be moving around a whole lot. We turned the place even more upside down than it was. Cleared out the living room...including some boxes that were "hiding" behind the couch for like 4 months. We brought things upstairs to the spare bedroom...did lots of dusting, sweeping, and mopping. But you know how it is...before things get better, they get worse. One room sparkles while another looks like a tornado hit. It's the process of chipping away. The other morning an unexpected package arrived at our door. I know I've mentioned on more than one occasion that I LOVE food gifts! So this was beyond a sweet surprise! We are long time fans of Stonewall Kitchen. Back when we were casual shoppers and drove all over Jersey finding cute little gift shops it seemed like we never came home without at least one item from Stonewall Kitchen...all of their mixes and jams and dips are so deeeelish! And when I think of them I think Fall! Again...what a gift. It came from a super sweet soul. An online friend, blog reader, & customer...no, make that repeat customer. And let me tell you...she had no cause (other than being extremely nice) for sending us anything. She had ordered some stuff from us for herself and then returned to order some things for a friend of hers. Unfortunately, we took an embarrassingly long time to get her order out to her, so we included some gifts for the trouble. So...what does this sweetheart do? She thanks us by sending us gifts! Geez! A heart of gold. Once again, I can't say it enough...I am just so thankful for the friendships we have cultivated over the years through art and blogging. And here's proof as to how much I loved this gift...from the second I grabbed it from my doorstep 5 minutes did not pass before I had my mixing bowl out, and very soon after that the house was filled with the scent of Pumpkin Scones baking in the oven! I cannot thank her enough for this gesture that truly warmed my home and my soul. So I had some other things planned for the blog this week, including a really really fun tutorial. And wouldn't you know it...yesterday while attempting to download pics, just as I do every single day, my camera tells me to "check connected device". Whaaat?! I can't stand technical difficulties, and the process of downloading pics from my camera to the macbook is such a simple one. I use the usb cord that came with the camera and just plug it right into the side of the macbook...easy squeezy. I'm nooo techy but I've been doing this sort of thing daily for years and I've never had a problem. The computer wasn't even acknowledging the camera. No folder popping up like usual. So, then I tried it on my desktop PC and the same thing happens! Next, I figured that I should just try the memory card. I inserted it into the PC...and nothing. Now, I've never used the memory card directly in this computer before, so I couldn't really narrow it down to being a problem with the memory card. Yeah, I wish I had another memory card to try out but of course I haven't seen any of those since moving. So at this point it's a toss up between a memory card problem or a problem with the usb...and of course I don't have an extra usb cord that fits in my camera. I spent three hours on message boards and help guides. The only thing that came up over and over was making sure that my camera was set to mass storage...which of course it was. Then I got the idea to insert the card into our printer...which I've never done...and the printer was able to read the card. So at this point it looked like the card was ok and it's probably the usb cord that has stopped working. But I also kept thinking "please please please don't let the problem be in my camera!" Well, I asked on facebook if anyone had any ideas. A few gals suggested that I get a card reader...one that I could plug right into the side of a macbook. This would eliminate the usb cord and also let me download pics without having the camera precariously attached. Wow, this stuff leaves me frazzled. We just rely on technology so so much and my mind immediately goes to all of this week's deadlines and putting together our Art Journaling class. Ok, with all that said (and I went into specifics just in case anyone out there suffered a similar problem) we'll be picking up a card reader today and hopefully, our troubles will be solved. Have you guys ever had this issue? Oh, and also let me tell you that I use a Sony A390 slr that I hook directly to the macbook...no software necessary...so it isn't a software issue. Aside from the camera issues I'm optimistic about this week. I welcome this chilly weather. Come night time we'll wrap up in a blanket on the couch, have some tea, and stream some horror from Netflix. I wish all of you guys a cozy week! Happy Columbus Day! what a cool thing to receive in the mail. Scones are wonderful. Oh that is SUPER sweet! Pumpkin scone mix - what a great idea!! I despite camera problems!!! My stupid camera uploading software just randomly decides not to upload some pictures, but uploads the rest. Luckily I was able to bypass it and upload them a different way. But seriously, so annoying! I hope you fis your little technical issues, because I can't wait to see what you have in store. On another note, I've put some of your art on my wishlist...I love it! I wish it was a little cooler here in Florida - wishing for NJ weather right now! 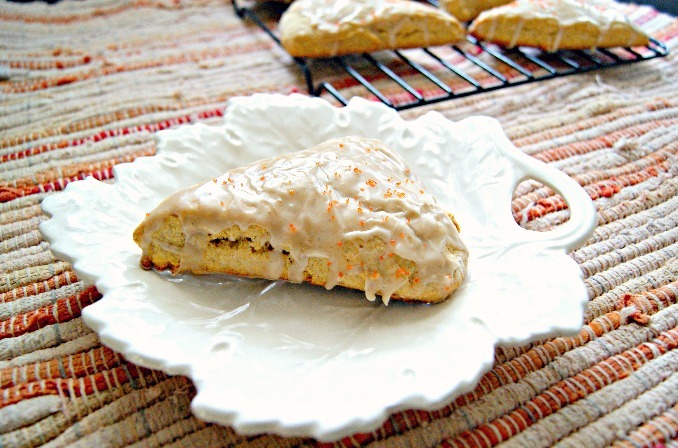 And that pumpkin scone - sounds heavenly! @fugeecat It really was such a FUN surprise! So so lovely of her! And they were really yummy! Thanks bunches for visiting and for your sweet words. I was going to suggest a card reader... I had that problem before and got one and haven't had a problem since!! Loving the happy mail... I love love love love anything pumpkin!!!! It was soo chilly last night! Yeah I love it! cardigan weather!! I have the same issue now ! It is my USB cord that is the problem. Well Christmas is not far we could ask for the outter drive or whatever it's called ! You just described how things were for me last night including the long sleeves and extra blanket. :) I kinda love it too. And what a sweet sounding customer, it's so nice to hear that there are still kind hearted folks like that out there. And good luck with your camera. I recently had to ship mine to Canon just to get it repaired, hopefully you won't have to do the same.